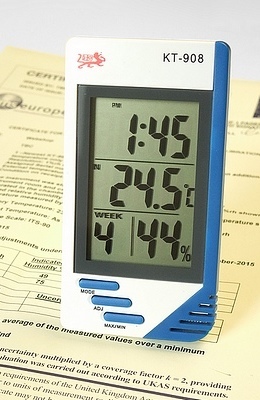 This thermo-hygrometer has a large LCD display that shows temperature, humidity and time. Each unit is UKAS Calibrated at 2 points of humidity and 1 point of internal temperature and comes with its own certificate of calibration. The hygrometer thermometer is ideal for monitoring the humidity in buildings and housing or anywhere where humidity, moisture or dampness is a problem. It incorporates a programmable audible alarm clock . The unit is housed in an ABS case that incorporates a useful foldaway stand.